I think my favorite things to make in the kitchen are bite-sized savory snacks. It’s easier to experiment with tiny treats because it’s just one bite, and you’re not committed to filling your belly with it. 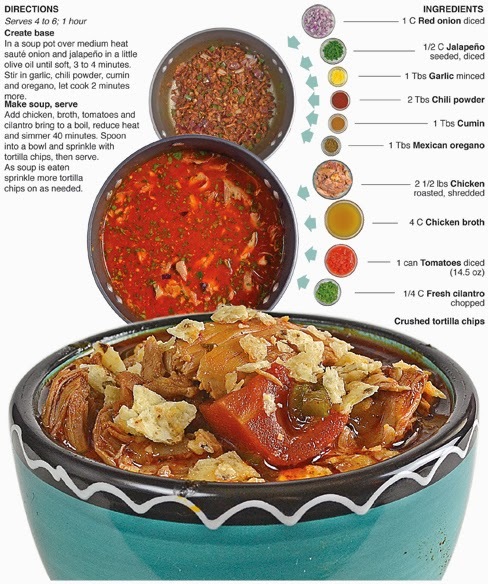 This allows room to work with a new ingredient or add a little more heat than usual. A small snack with some spicy fire is much more tolerable than an entire main course, which can affect a person for hours afterward. 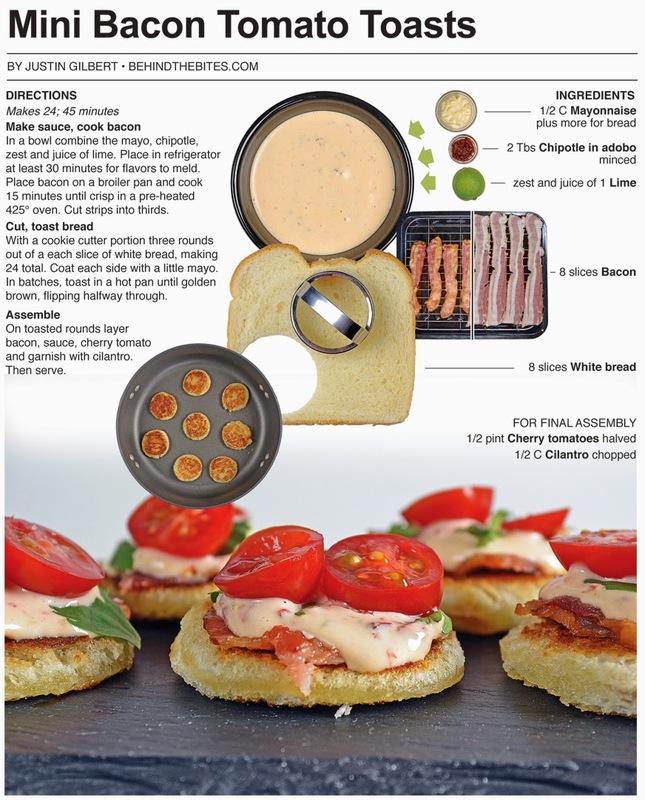 For this recipe, I make a bite sized play on the classic BLT. 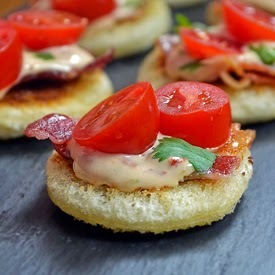 I use cherry tomatoes with bacon on little toasted bread rounds cut from a slice of bread. I replace the lettuce with a sprinkle of cilantro and add a special mayonnaise based sauce featuring smoky chipotle pepper, to compliment the bacon, and the juice and zest of lime to brighten up the flavor. The combination of the sauce and cilantro give this little mini bacon sandwich a spicy southwestern flavor that will help make a plate of these disappear as fast as common sense from a newly elected member of congress. I rarely muse about my writing process, but I have a little insight to my thought process. For three years, while I lived in New York, I performed stand up comedy, which was long enough to have a few minutes of decent jokes to perform. Good stand up is really about good writing, when I sat down to write new material I would start with a story and look for opportunities to insert something witty. Once I found a spot for a joke I would write several different punch lines until I found something that I thought would get laughs, often I would come up with a number of lines before I found the one that I wanted to perform. ... help make a plate of these disappear faster than a crowd of teenagers from beer bash in the woods busted by the cops. ... help make a plate of these go down faster than glasses of beer on penny draft night at the local college bar. ... help make a plate of these disappear faster than a pocket full of change at convention for pan handlers. ... help make a plate of these disappear faster than free bullets at a gun convention. I think I chose the best one. In a bowl combine the mayo, chipotle, zest and juice of lime. Place in refrigerator at least 30 minutes for flavors to meld. Place bacon on a broiler pan and cook 15 minutes until crisp in a pre-heated 425° oven. Cut strips into thirds. With a cookie cutter portion three rounds out of a each slice of white bread, making 24 total. Coat each side with a little mayo. In batches, toast in a hot pan until golden brown, flipping halfway through. 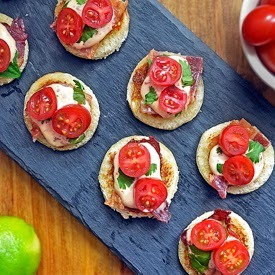 On toasted rounds layer bacon, sauce, cherry tomato and garnish with cilantro. Then serve. 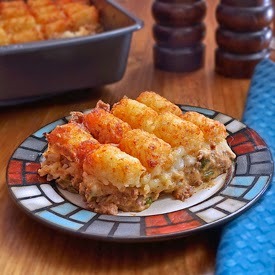 Tater tot casserole is a classic and I have been eating it at family gathering and pot lucks since childhood. 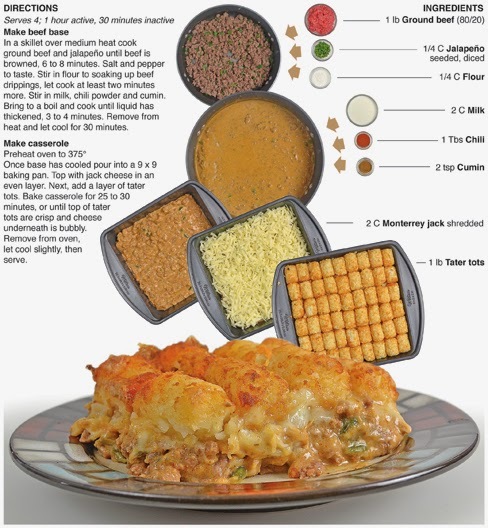 There are many variations of the dish, but the majority involve ground beef, canned cream soup and are topped with tater tots. I decided that it was time to make my own version of the casserole but knew I had my work cut out for me, because if I was going to recreate a dish so universally loved I was going to have to swing for the fence to do it justice. 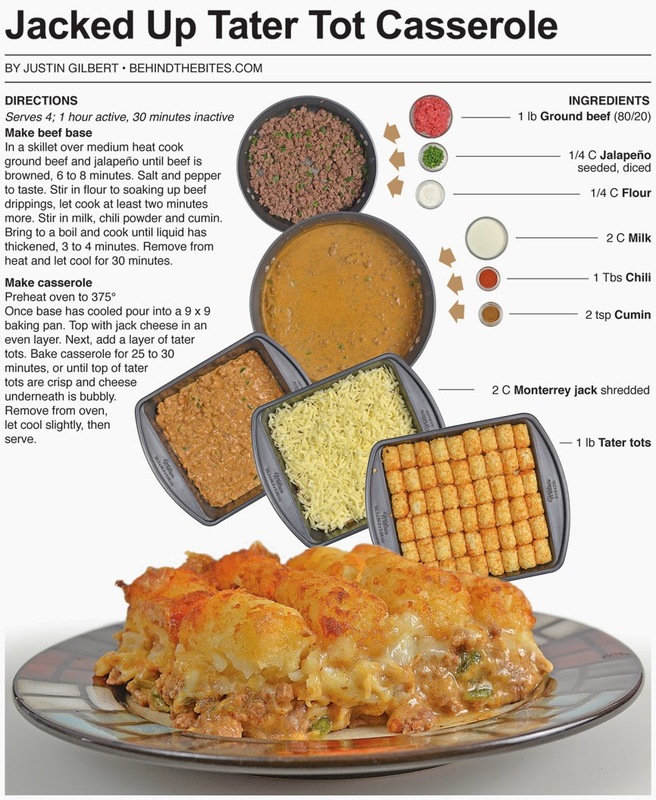 For my version of tater tot casserole, I replace the traditional canned cream soup and ground beef mixture that serves as the base with a thick, taco flavored ground beef gravy that comes together much like a scratch-made sausage gravy. It is topped with the usual tater tots, but in between the base and potatoes I place a thick layer of creamy jack cheese. The end result is a delicious Mexican flavored casserole topped with crispy tater tots that’s sure to give the classic version a run for its money. This version of tater tot casserole is absolutely fantastic. I pulled it from the oven and let it cool a little before starting to photograph it. I sampled it to check the flavor and it was all I could do to keep myself from eating the entire pan before even getting a the final shot of the recipe. The taco-chili flavor of the beef gravy combined with the jack cheese and crispy tater tots was literally the best tater tot casserole I had ever eaten. I took some to share with Mom and Dad that evening and they both agreed that it was out of this world. If I were to ever own a restaurant I would try to put items like this out for daily specials to see how they would go over. I have never seen a tater tot casserole on a restaurant menu but if I were asked to make a version for one, I would start with this. The only change would be to make the potato topping from scratch - That would make this totally gourmet! In a skillet over medium heat cook ground beef and jalapeño until beef is browned, 6 to 8 minutes. Salt and pepper to taste. Stir in flour to soaking up beef drippings, let cook at least two minutes more. Stir in milk, chili powder and cumin. Bring to a boil and cook until liquid has thickened, 3 to 4 minutes. Remove from heat and let cool for 30 minutes. Once base has cooled pour into a 9 x 9 baking pan. Top with jack cheese in an even layer. Next, add a layer of tater tots. 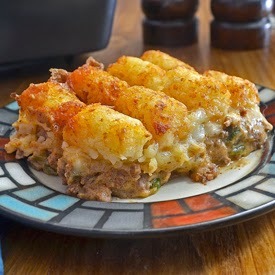 Bake casserole for 25 to 30 minutes, or until top of tater tots are crisp and cheese underneath is bubbly. Remove from oven, let cool slightly, then serve. This sauce is an obvious twist on traditional thousand island dressing, only I have replaced the ketchup with chili sauce and the pickle relish with pickled jalapenos. 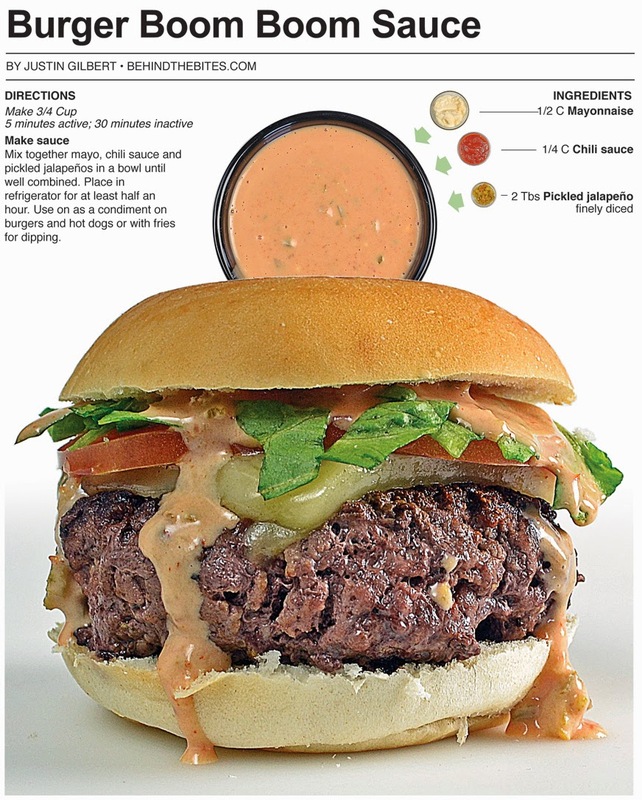 I first tasted a sauce like this at Williams-sonoma with their “Burger Bomb sauce” which was good, but I knew it was something that I could recreate from my pantry. 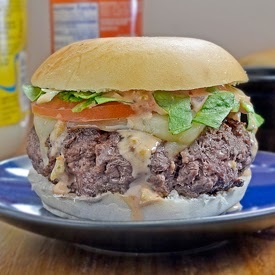 I’m sure the Burger Bomb is a little more complex than this simple sauce, but it works. 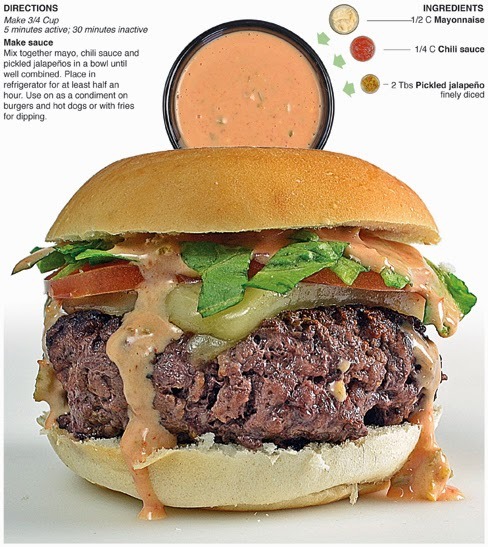 The mayo, pickled jalapenos and chili sauce could all be put on a burger separately to enhance the flavor of a sandwich – I just went the extra step and made a sauce out of them. I would like to build from here with this one. I think that I could add a couple more elements to brighten up the flavor like lemon juice and zest as well as give it a little more kick with the addition of cayenne pepper or red pepper flakes. 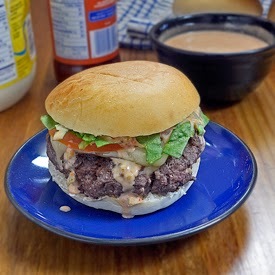 I want to improve the sauce but it was fun to make, came together fast and made a good burger great. Can’t ask for more than that when you’re cookin' on the fly! I’m still working hard on taking better sandwich photos. The sandwich photographed here looks a little fat. I trimmed the top and bottom bun down and I think I went a little too far because it looks like a slider, but it’s not. The patty is a half pound monsters. The trimmed buns around the sandwich remind me of those photos of people at Walmart that get shared on Facebook - the buns are like a tight top and shorts surrounding an exposed rotund belly. 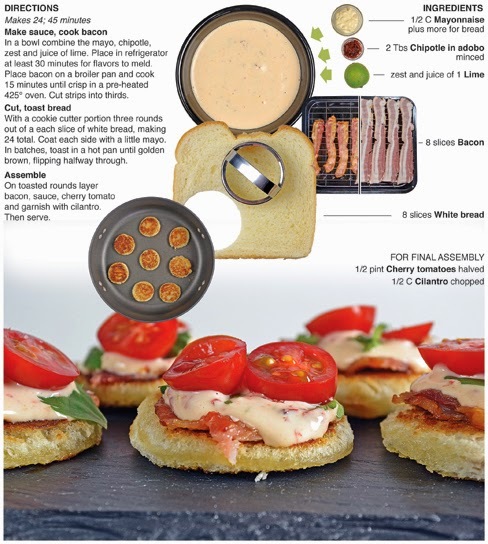 Having said that, I still think the sandwich in the photo is appetizing it just needs more on the buns – I think I have actually said that about a female once or twice in my life and feel like a real food geek saying it about a picture of a sandwich I made – but so be it! My food photography is still a work in progress. Can't wait to shoot another one soon. Mix together mayo, chili sauce and pickled jalapeños in a bowl until well combined. Place in refrigerator for at least half an hour. Use on as a condiment on burgers and hot dogs or with fries for dipping. So, what happens when I notice that ground beef, bacon and Italian sausage are on sale at my local super market? 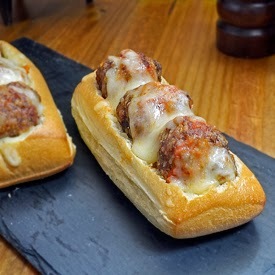 Meatballs subs for dinner! The bacon and sausage were the star flavors and the ground beef was there more for volume. I made these in the afternoon and wasn’t sure what I was going to do with the finished product. I thought of trying them over pasta like traditional meatballs but wasn’t cracked about that because of their unique flavor. I flirted with dropping them into corn muffin batter then baking them off to make meatball corn muffins, but I ran into a problem which led to a great corn muffin recipe. In the end, I decided that a sub with pizza sauce and cheese was the way to go. The combo of meats reminded me of a meat lover’s pizza so I thought a sub to carry those flavors would work well – and it did. This was probably the best meatball sub I have ever had, but then again, it’s the only meatball I’ve ever tried made of bacon, Italian sausage and ground beef - which is a tough meatball to compete with. I bought these sub buns at Walmart. I usually use these buns for photographing hot dogs because they look good in pictures and come without having been pre-sliced. I decided to try them with these subs which meant I had to hollow them out. This created a hot-dog-bun-sized bread boat to work with. I stuffed them with the meatballs and toppings then baked them off, which really did the trick. They crisped up on the outside and were moist on the inside and provided the perfect delivery system for the tasty meatballs. They reminded me of mini French bread pizzas that had been toasted and made crisp. When I have used them in the past strictly for a good photograph they seemed a little chewy, I discovered that baking them toasts the outside and fluffs the inside. I want to try them again with brats or sausage from the grill. Walmart really came through with these buns! In a large bowl mix together ground beef, Italian sausage and bacon until well combined. Mix in bread crumbs, Parmesan cheese and egg until all ingredients are well distributed. Roll meat mixture into 1-inch meatballs. Makes 44 to 48. Place meatballs in cups of a mini cupcake pan. 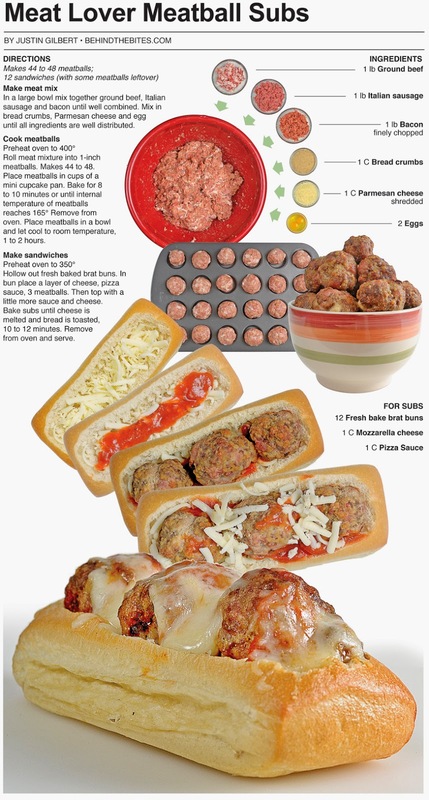 Bake for 8 to 10 minutes or until internal temperature of meatballs reaches 165° Remove from oven. Place meatballs in a bowl and let cool to room temperature, 1 to 2 hours. Hollow out fresh baked brat buns. 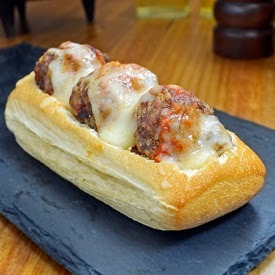 In bun place a layer of cheese, pizza sauce, 3 meatballs. Then top with a little more sauce and cheese. 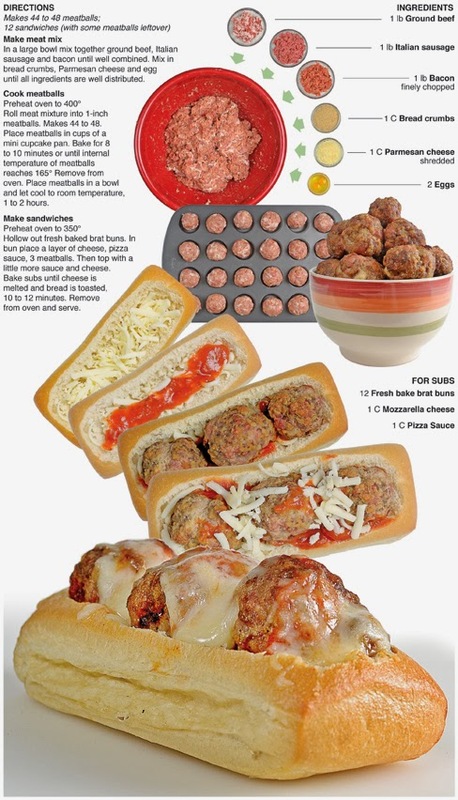 Bake subs until cheese is melted and bread is toasted, 10 to 12 minutes. Remove from oven and serve. I walked into Walmart recently and was assaulted by the aroma of juicy and succulent rotisserie chicken! I felt as though I had been sucker punched by the ghost of Colonel Sanders and an instant craving for chicken arouse from my belly. All the local super markets seem to strategically roast a flock of chickens just as the day shift is getting off work and are shopping for dinner with an empty stomach. The rotisserie chicken is good to eat while it’s fresh but it’s also excellent after a night in the fridge, especial when the meat is removed and shredded. 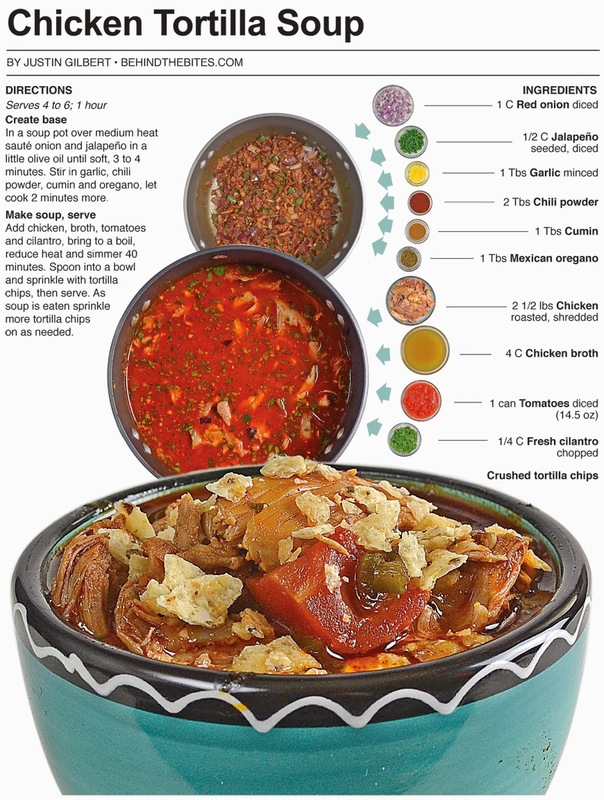 For this recipe, I make a tortilla soup with leftover chicken, any roasted chicken will do, not just super market rotisserie chicken. 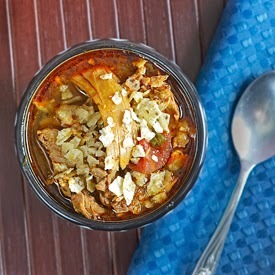 Instead of adding soft corn tortillas to the soup as it cooks, in this version I crumble tortilla chips in as it is served, like I would saltines in chili, creating a little texture as it’s eaten. Also, it’s simmered for 40 minutes which renders the chicken even further and helps make the broth extra rich and flavorful. In the introduction I muse about the wonderful aroma of rotisserie chicken at the local super market, and I have used it many times for soup. The soup documented here features roasted chicken but not from the local super market. It features leftover chicken from my previous post. Had I not had it leftover in the fridge, I would have went to Walmart and bought a rotisserie, but I had roasted 5 pounds of quarters the night before and only ate one of the quarters. 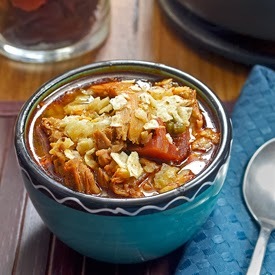 This is where most of those leftovers ended up – And I have to say the flavorful chicken was the perfect exclamation point in this delicious soup. I have found that when using dark poultry meat in a soup, it’s best to let it simmer on low for around forty minutes before serving. I think it renders fat from the meat and creates a rich and tasty broth that is straight up out of this world, I did that with this soup as well as with a batch of white chili from a while back. I must say, the extra simmer time turns a good soup into a great one. In a soup pot over medium heat sauté onion and jalapeño in a little olive oil until soft, 3 to 4 minutes. Stir in garlic, chili powder, cumin and oregano, let cook 2 minutes more. Add chicken, broth, tomatoes and cilantro, bring to a boil, reduce heat and simmer 40 minutes. Spoon into a bowl and sprinkle with tortilla chips, then serve. As soup is eaten sprinkle more tortilla chips on as needed.